A U.S. Justice Department review of the troubled San Diego Police Department is underway and will take about six to eight months to complete, federal officials said Monday. It was also revealed that the U.S. Attorney’s Office and FBI are leading a criminal probe of the SDPD. 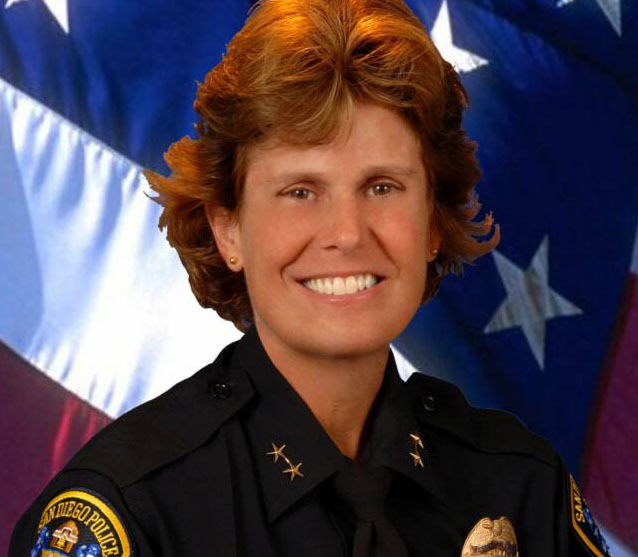 San Diego Police Chief Shelley Zimmerman. Official photo. “We believe every rock should be turned over, and if — and I do emphasize if — crimes were committed in addition to those already prosecuted, perpetrators should be brought to justice,” said City Attorney Jan Goldsmith, who announced the criminal investigation. He told reporters that the probe was “case specific,” but would not elaborate. The audit of the police department, requested by recently retired Chief William Lansdowne, will be handled by the Justice Department’s Community Oriented Policing Division, U.S Attorney Laura Duffy said. She said investigators will interview officers, watch them in action and conduct research. The investigation is an “absolutely necessary” step in rebuilding the police department, the mayor said. Lansdowne’s successor as chief, Shelley Zimmerman, said the department has logged 15 cases of misconduct over the past several years. Those acts “cast a shadow of doubt” over all law-abiding officers, West said. Ronald Davis, the head of the COPS program, said the audit will come at no cost to the city. Linda Workman, a lawyer for a woman identified only as Jane Doe, who is suing the city over the actions of convicted former Officer Anthony Arevalos, said the audit doesn’t go far enough — that an independent monitor should be appointed who has the authority to force change in the SDPD. The lawyer and city have not been able to agree on a damage award for the woman. A trial is set for July.